Halloween is only 17 days away! Usually by now, my kids have their costumes all ready to go. This year, we're getting a little slower start. Robbie is all set. He's going to be a pirate. I bought the costume on ridiculous clearance last year, kept it hidden in my closet and got it out just a few days ago. It was a pretty perfect fit and he was thrilled. So one kid down. Annie knows what she wants to be -- a ninja. But I don't have any idea what that means in terms of costume, thought I'm pretty sure a (fake) sword is involved. I know I could probably just go buy a ninja costume, but I'd much rather go the cheap route and pull it together with stuff we have as home. Charlie isn't sure. First, he said he wanted to be Michael Jackson. Hmmm...not so sure I'm crazy about that. Wonder if we could do a humorous take on the "King of Pop?" Like make a costume out of Diet Coke boxes and stick a crown on his head. His other choice is Danny from the movie "Grease." That's a possibility. Jeans and a white t-shirt. Wonder if I could find a small black leather-ish jacket at the Goodwill? As for me, I'll just go as a Mom. I used to have a cute little Halloween sweater that I would wear for the festivities. But it's been so blasted hot here in late October the past few years, that the mere thought of putting on the sweater made me sweat. So I gave it away. Do your kids trick-or-treat? What are they going as this year? What do you do with all that candy? Over at the Fit City Moms Blog, I posted details about the Great Halloween Candy Buy-Back that we've done in our house for a few years. Check it out and leave a comment there about whether or not you think your kids would go for it. Don't ninjas wear all black? We have a great plastic sword from one of the summer festivals that you can borrow. I always have such a hard time figuring out kid Halloween costumes! 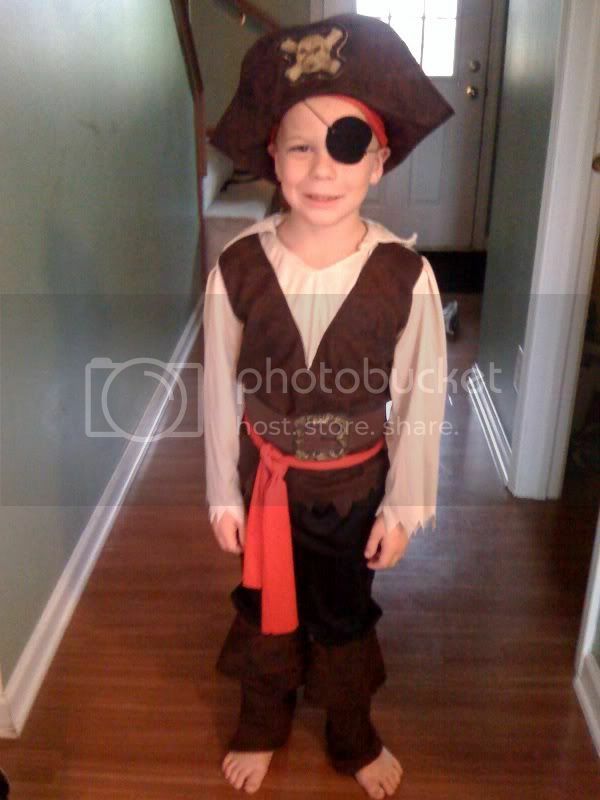 Mine have both been pirates ... love that costume. Cute and cheap! Have Charlie go as "Balloon Boy!" Jeremy doesn't sound like he is doing anything, and Gabi and Preston are going as Stephanie and Sportacus from Lazytown! Hint for the sword: draw it on cardboard, cut it out and cover with aluminum!